Haugesund Stadion is a multi-purpose football stadium located in the city of Haugesund, belonging to the Haugaland region. 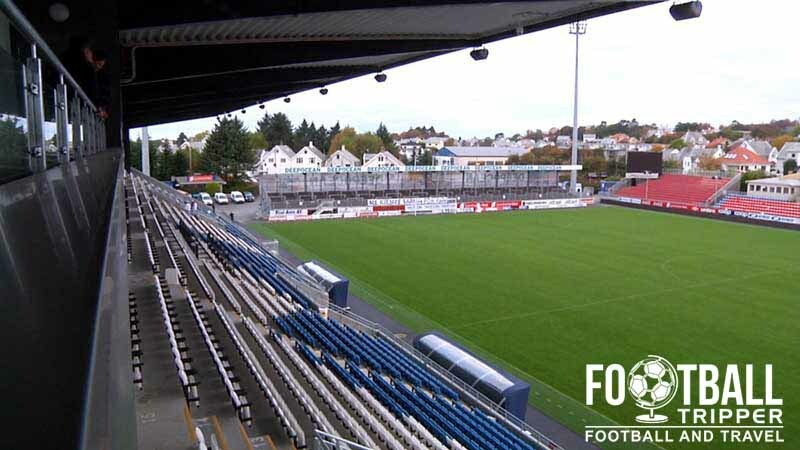 Home to Tippeligaen team FK Haugesund and lower league side SK Vard Haugesund, the ground has undergone a series of extensions to each stand since 2012 with the capacity rising to 8,754 from 5,200. An expanded history section will be added in due course. Please note: “This stadium has been rebuilt since your pictures were taken. This is the new stand, with a roof. Capacity is now 9000 +.” Thanks to Pål Andreas Mæland for this update!. Haugesund Stadion is comprised of four stands: North, East, South and West. Away fans (Bortesupportere) are housed within sections G and H within the south stand as per the above seating plan. Visiting supporters are usually allocated 560 seats per match, and tickets cost 200 NOK for adults. FK Haugesund’s fan shop is located within the northern goa-end which is known as the Kraft Tribune. It’s usually open on matchdays from three hours before kick-off and for 30 minutes after the full time whistle only – never during the week barring special occasions. 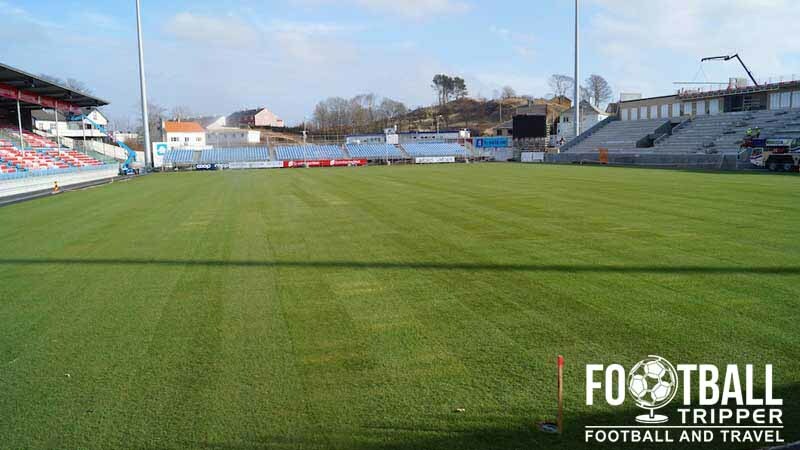 It seems very unlikely that tours of the facilities at Haugesund Stadion are available to the general public as there isn’t reallly much to see! 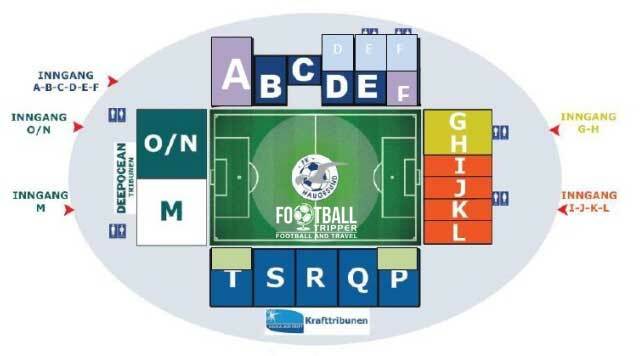 Tickets to see FK Haugesund can either be purchased online from the official website or from the ticket-booths at the stadium just before kick-off. Prices start from 125 NOK for adults, but usually average out at around 200 NOK for a semi-decent seat. 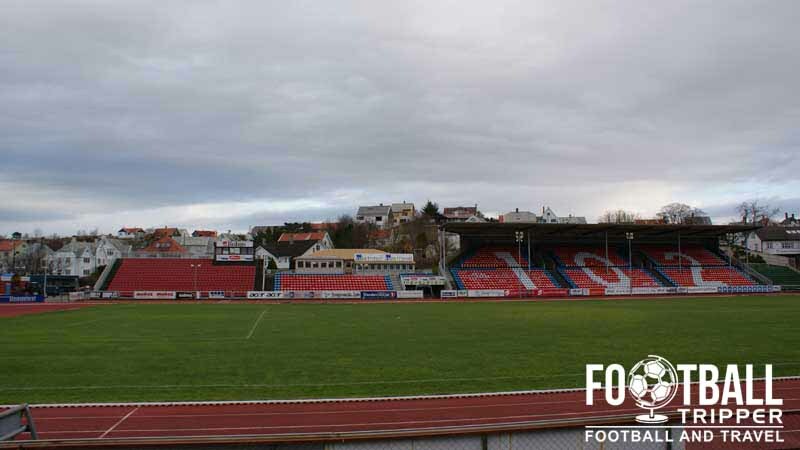 Haugesund Stadion is located centrally within the town just beyond the main road which runs parallel with the coast line. From most places in the municipality Football Trippers should be able to walk to the stadium in just under 15 minutes. There appears to be limited parking available at the stadium however we’re unsure as to whether or not it can be used on matchdays. The town of Haugesund lacks its own train station as Rogaland County lacks railway infrastructure due to the geographical nature of the Norway. A look at the on-site parking and the exterior of the second stand. Haugesund Stadion bus stop sits on the Karmsundgata main road and is served by bus numbers 41 and 60 which go to and from the bus terminal. The closest major airport is Haugesund Airport in Karmøy which is found on the adjacent island approximately 14 km away along the E134 motorway. Upon landing you can catch one of the coach services to the town centre. The compact town centre has a number of hotels such as Best Western, Clarion Collection Hotel Amanda, and Thon Hotel Saga. The most affordable option, Skeisvang gjestgiveri is located 15 minutes north of Haugesund Stadium along Skjoldavegen.